I’ve been with Pool Troopers for eight years now. I came in on the ground level and started out as a pool cleaner. I worked in the chemical department for a few years and then I moved into the mechanics department where we work on the inner workings of pools, things like filters and pumps. I was naturally drawn to it, partly because I’ve been working on cars with my Dad and uncles since I was 10 years old. I strive to be the best at whatever I do. My dad was a schoolteacher so I’ve always understood the value of learning and working hard to get ahead. Right from the beginning I knew that opportunities for advancement were performance-based, and that really spoke to me. It’s a very hands-on job. During training you’ll learn a lot but sometimes you’re just going to be out in the trenches and you’ll have to figure out what to do. You should be the type of person who naturally pays attention to details. When you’re working on a pool you’re the front line and you have to be able to shoot the breeze while you keep working. Having a good attitude is essential. When you’re positive the customer feels it. And be excited for what you’re about to get into. You’re not going to find another company like this, where they treat you as well as they do here. We’re really like one big family, from our customers right up to the top. It really makes you want to take care of your customers. There’s always room for advancement – do a good job and you will move up. Being friends with the customers – I like that. I like making people happy. When I was the chemical guy and moved to mechanical, my customers were a bit mad that I was moving on. I’ve always been a people pleaser so knowing we’ve taken care of our customers helps me sleep at night. I like the work. I like to be hands-on, problem solve on the spot and don’t mind a bit when it comes time to get my hands dirty. 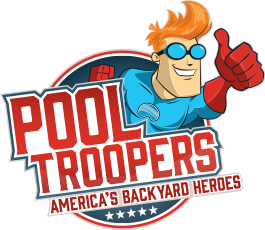 Q: What does the Pool Troopers phrase "We've got your back" mean to you? We work pretty much independently but we stay in touch with each other throughout the day. Right now there are just two of us on my team so we’re always helping each other out in some way or just checking in. We’ve come to rely on each other and we take pride in helping one another finish a job. Sometimes just being positive and telling someone ‘you’re doing a great job’ can make his or her day. That really goes above and beyond and you don’t see that a lot anymore. 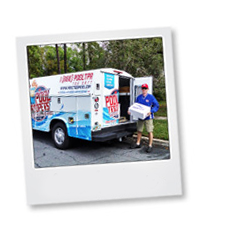 We’re all on the same page and working toward the same goal – taking care of our customers. This company kind of changed my life – when I started working here it allowed me to grow up. Gary and Dave helped to reinforce my work ethic; they made me want to move forward. Now I have a home, a wife and I excel in my job. I’m stable and I know I won’t have to worry – I have job security and a career. They’ve always treated me like I was part of the family. I was never afraid to go in to the president’s office to ask a question or give a suggestion. They’ve always taken real good care of us, they offer everything you can imagine – 401K and short-term and long-term disability. I don’t want to go anywhere else.